Whether you’re an active or aspiring iPhone or iPad developer, you’ll really appreciate these nice PSD files from design agency Teehan+Lax. 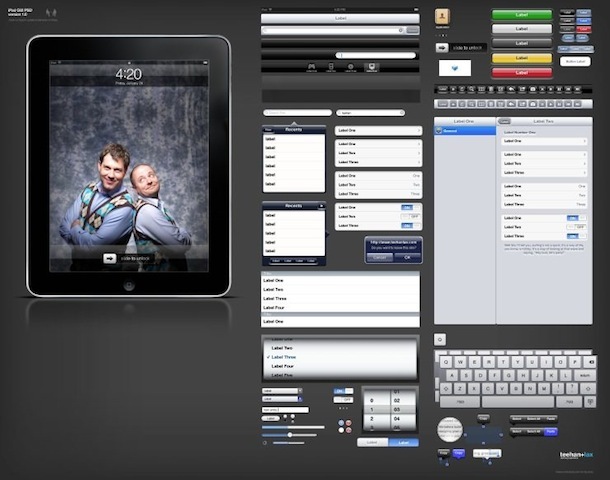 They contain well organized layered images of essential GUI elements of the iPhone OS, sized accordingly to the iPad and iPhone (depending on which PSD file you get, of course). Using these documents with Photoshop you can just open one of the PSD’s and arrange elements around to make a quick GUI mockup for your app idea. There’s also an Adobe Illustrator sketch file for iPhone elements if Photoshop isn’t your thing. I’d highly recommend downloading all three of these files, they really help to quickly create layouts and mockups for iPhone and iPad app GUI’s. The SDK’s Interface Builder app may be foreign to you or your GUI designer, but these files will be a lot closer to the typical Adobe comfort zone. And if you’re a iPhone OS developer, don’t forget to check out Apple’s official Human Interface Guidelines and Teehan+Lax’s blog either.